+Friendly character call-out’s is a welcomed tactical use for those not using headsets. +Warzone offers a unique blend of competitive PvP and Player vs A.I. Many things have changed over the last couple of installments with Halo as a franchise, especially to the multiplayer what seems to remain as the game’s core piece and keeps the fans coming back more than once. Unlike Halo’s Reach and Halo 4, Halo 5: Guardians has decided to step back from how we knew Spartan Abilities to work by having completely removed them and once more placed Power Ups back into the game the way they needed to be. As this has helped return Halo to its former glory, don’t let this change throw you off as things such as increased speed, active camo and the likes have all been thoroughly implemented into the game thanks to Halo 5: Guardians and how the REQ system works. So what exactly is this REQ system that’s been mentioned several times? For those of you who haven’t had a chance to jump onto Halo 5’s multiplayer yet here is what the REQ system is. By playing matches, winning, losing or whatever have you, REQ points are earned for completing matches in general. Through meeting certain requirements or simply saving up points, players have the chance to unlock new REQ packs, which in-turn can be purchased in order to unlock new things such as weapons, vehicles, exp boosters and even certifications for new items via the REQ pack unlocks. These packs can can also contain unique versions of each gun as well as rarities that provide slightly different capabilities than lesser versions. Though these weapons can only be used in Warzone modes, it’s nice to see them available for those wanting to use them. 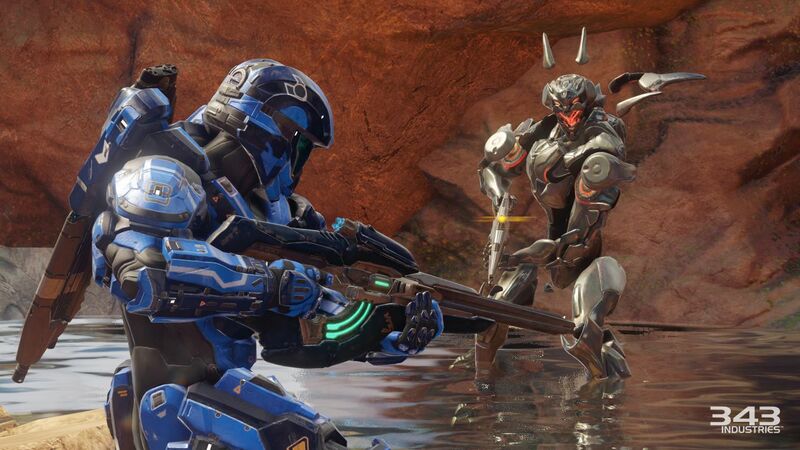 While much of the multiplayer remains untouched from the previous mentionings of REQ Packs we do see a few things that would have been viable to the game outside of Swat, Team Arena, Slayer, Breakout, Free-For-All, Weekend Shotty Snipers, and Weekend Doubles with Big Team Battle to be introduced into the game in the nearby future in the games next content update. While many of these modes may seem fairly simple to understand, there are rankings for each one that players will find themselves earning in order to compete with people of similar play styles as well as skill levels known as CSR (Competitive Skill Rank). Thanks to this new system players are divided into several categories such as Bronze, Silver, Gold, Platinum, Diamond, Onyx and finally Champion. Thanks to this new system players will find themselves growing in rank as they win matches as well as decreasing in progress towards their next rank as their teams proceed to lose, which is great, but also punishes players who may have done great on their team only to have been let down by their teammates who may be complete randoms. While Bungies old ranking system was interesting, hard and downright challenging – it almost seems this new system is to balance out the good, the bad and the pro in different ways. The issue with this one? Your rating is also based on your win/loss ratio during your matches as well as your performance overall. I got stuck into Diamond, the issue? I only have a 0.87 K/D which pales into comparison against some of the people I’ve managed to play Halo 5’s multiplayer with. While I could write extensively on the changes that have been made as well as their supportive attempts to play fair for an entire community, let us take a look at the things that hold Halo 5: Guardians back in ways that Halo 4 succeeded and still does at its core. While the newest game mode Breakout offers a unique spin on the familiar gameplay seen in Call of Duty’s Search and Destroy, the newest mode offers fans a chance to fight over a singular flag with one life in this Sudden Death version of Capture the Flag. While the mode is fun, challenging and ultimately difficulty – some do tend to treat it as an elimination mode, which takes away quite a bit of the games fun. But in truth? It still doesn’t take away the fact that Halo 4 still succeeds in many ways that Halo 5 does not. 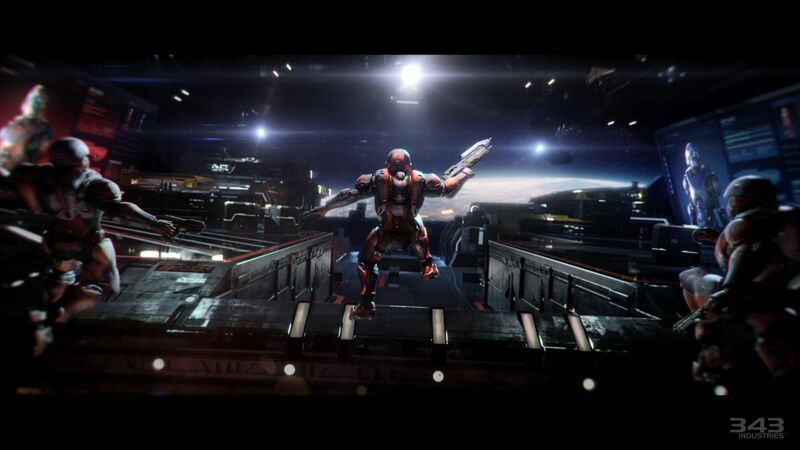 Many of you are probably familiar with the episodic storyline from Halo 4 known as Spartan Ops. In this mode players (up to 4) took control of Spartan-IV team members in order to complete special tasks that would help the USS Infinity gain more knowledge of the enemies they are up against. Let alone did this chance give them boots on the ground outside of Master Chief and his hunt for the Didact as well as the after events, but it also gave the newer Spartan-IV’s a chance to go from green to mean. Their story primarily covered the hunt for Doctor Catherine Hasley, the very woman responsible for the experiments that lead to Spartan Augmentations being possible. As she is hunted the teams find out more and more about what’s going on behind the scenes and in turn Hasley is painted to be a traitor. While many of you may know the occurrences, lets leave the rest to wonderment by those who have not had a chance to play Spartan Ops just yet. While this series was a large fuel for success in Halo 4, many players have been clambering for more episodes, some that even take place during the events of Halo 5: Guardians so that players can see more on the side of what Sarah Palmer and her command of Spartan-IV’s can do. Especially with our new villain literally tearing the universe apart just because he or she can. While this episodic series could pose a chance for return thanks to fans hitting the Halo Waypoint forums by force, Halo 5: Guardians could use a bit more to it as the story, as you read in our last review was lacking, plot-hole filled and needed quite a bit of filling in, which Spartan Ops would offer a nice chance for 343 Studios to do in a future update. The only downside? They’ve pretty much said this wasn’t happening according to several websites, we can only wait and see what happens to this since 343 Studios carefully crafted both Spartan Ops and Firefight together with Warzone. Downside? If that’s what we are stuck with, there seems to be quite a few fans that aren’t having that slice of cake and even eating it. They’re throwing it on the ground. Much like Spartan boosters that can be activated during combat, so let us discuss the new Spartan Armor system. While many of you might be giving off a small shriek of hope for abilities such as Promethean Vision, Active Cloak, Hardlight Shield and the others I would like to say, it’s okay to cry, they’re gone. While it would have been nice to see such streamlined capabilities came back, 343 Studios Opted for something a bit more useful, self-explanatory and unique based on the Spartan Armor tech that the UNSC and ONI command would realistically be using. So what did they bring in? Boosters, thrusters and even hovering modes on the armors allowing for players to hover while using ADS, slide and shoot after sprinting, wall climbing and even a boost that allows players to quickly maneuver to a direction they desire. This allows for players to clamber up walls in order to hit those ledges they need, but also requires a new sense of awareness as players may just get shot in the back if they aren’t careful. All around Halo 5: Guardians remains quite unchanged in comparison to past titles. Thanks to a slight boost in both combat pacing as well as situational awareness, Halo 5 remains very much the title we’ve grown up with regardless of the small changes that have been made. Whether you use hipfire or ADS, boosts or no boosts or even simple things such as power-ups in Warzone, players of all types will find this game quite suitable for themselves no matter which mode they find as their own. 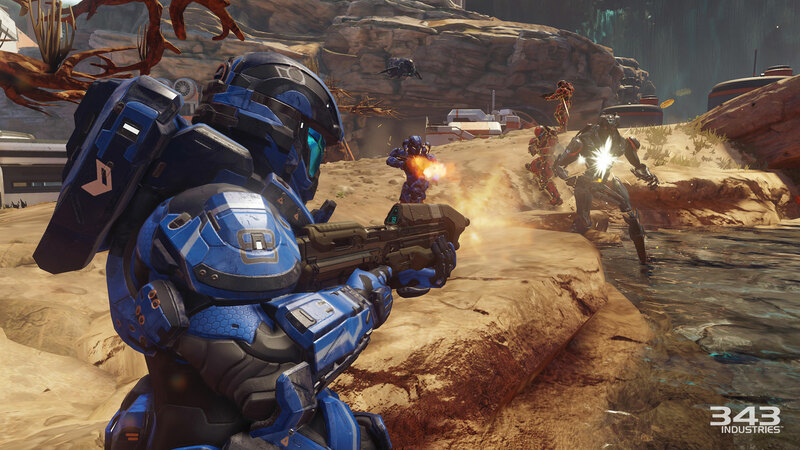 Halo 5’s multiplayer sticks true to its roots in many aspects while risking influences heavily seen in modern FPS titles. While transitions may be difficult for some to learn, Halo 5: Guardians’ multiplayer remains very much the same beast as before. Now if only we could get Custom Games matchmaking and an arena mode for Griffball. 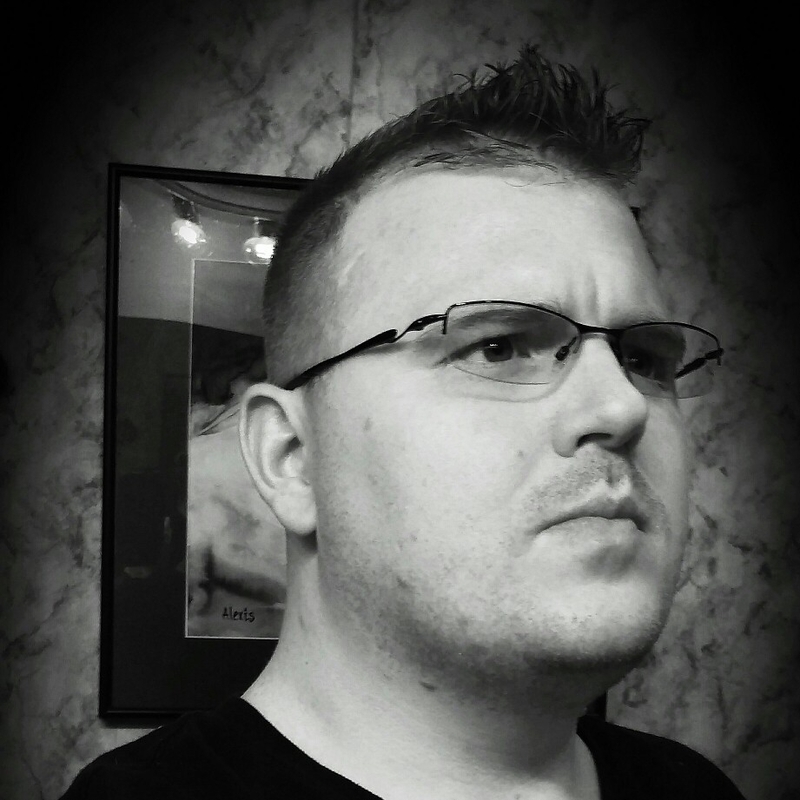 Our review is based upon the final version that one or more of our team members purchased. For information about our ethics policy please click here.